Beautifully Decorative Antique Oversized Persian Khorassan Rug 48825, Woven In the Country: Persian, Circa: 1920’s – This oversized antique Persian Khorassan rug is a masterclass in symmetry and design. 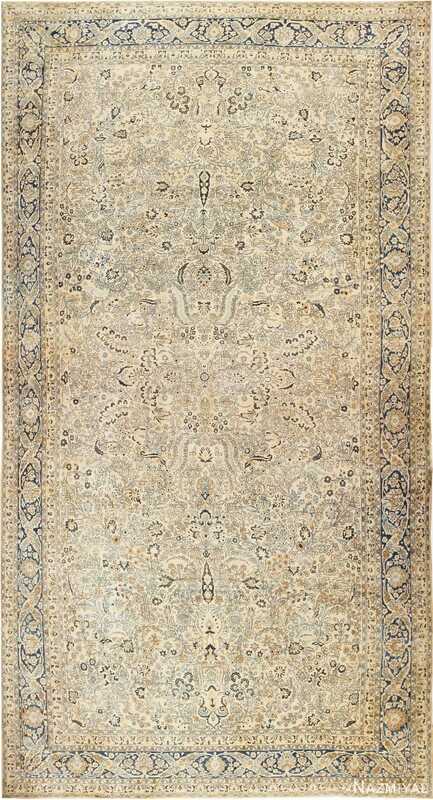 This huge antique Persian rug boasts a central theme of refined floral patterns that masterfully covert the majority of the background. 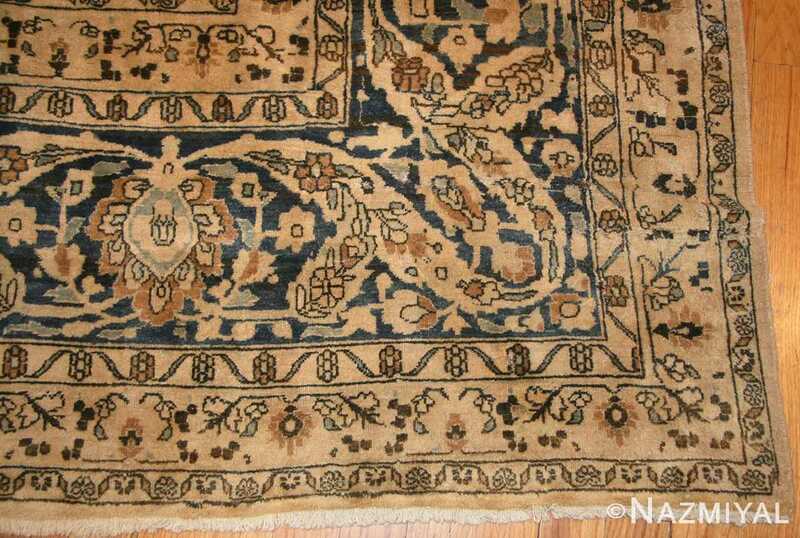 Starting on the outer periphery of this magnificent antique oversized Persian Khorassan rug, there is a very thin and quaint floral pattern guard border. 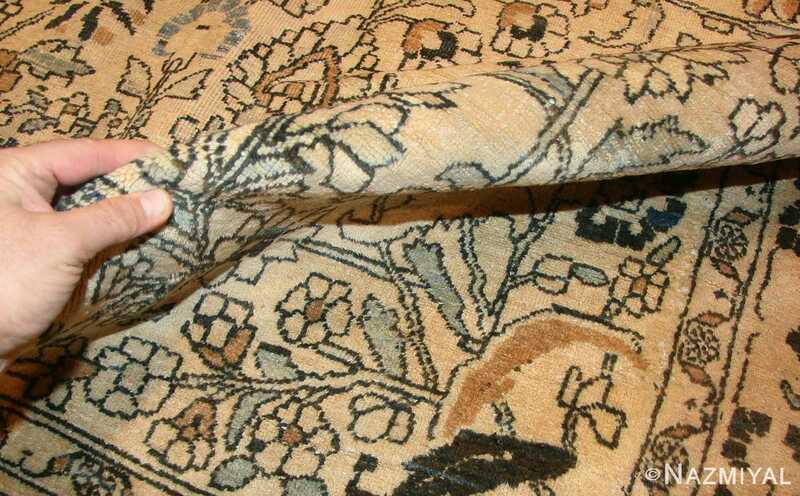 The rug design pattern itself is extremely simplistic, which nicely juxtaposes the more complex pattern found in the next inner layer of the border. Not only is the next inner layer more complex in terms of design, it is also larger and introduces some new colors into the palette. This next guard border adds more blue hues to the original beige with hints of earthy brown. Working in even farther, the next layer is again small, with a simple design. 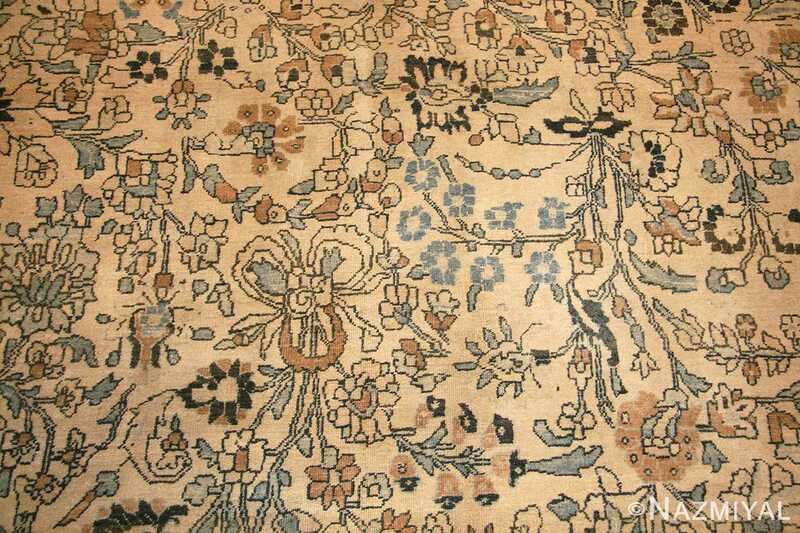 While almost as simple as the outer most layer, this new layer incorporates the brown and blue colors previously introduced more prominently. Both the first and third guard borders feature a series of singular flowers that are interconnected through a meandering vine scroll. This vine scroll also gives us a feel of geometry that contrast with the more curve linear design approach of the main border and central field. The next layer inward displays a much larger and more complex floral pattern that utilizes a beautiful light royal blue background color. This main wide border is the only section of the rug that reverses that colors. While most of this oversized carpet features a cream beige color background with blue patterns, in this main border, the majority of the design is rendered in cream against a blue background. 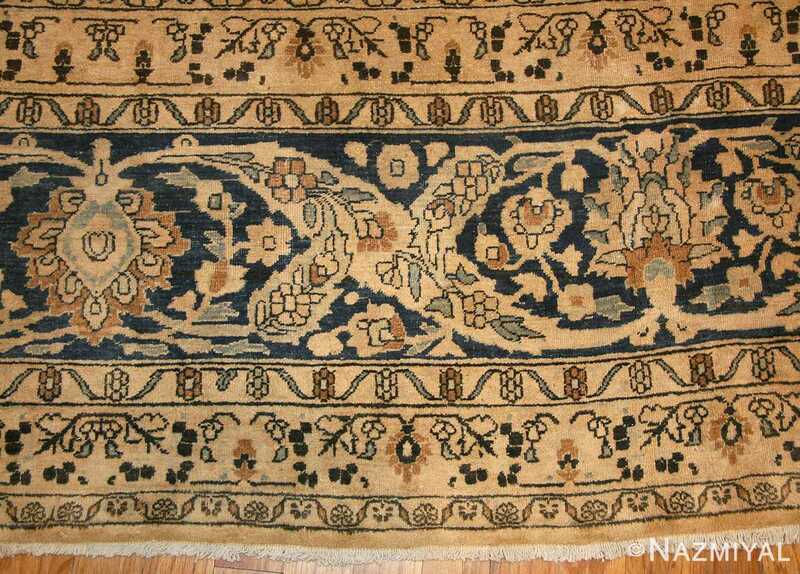 The end result and a magnificently artistic encompassing border that frames the antique Persian rug perfectly and adds a sense of balance and completeness. This main blue colored border is flanked on either side by mirrored guard borders. This enhances and supports the overall meticulous approach to symmetry. 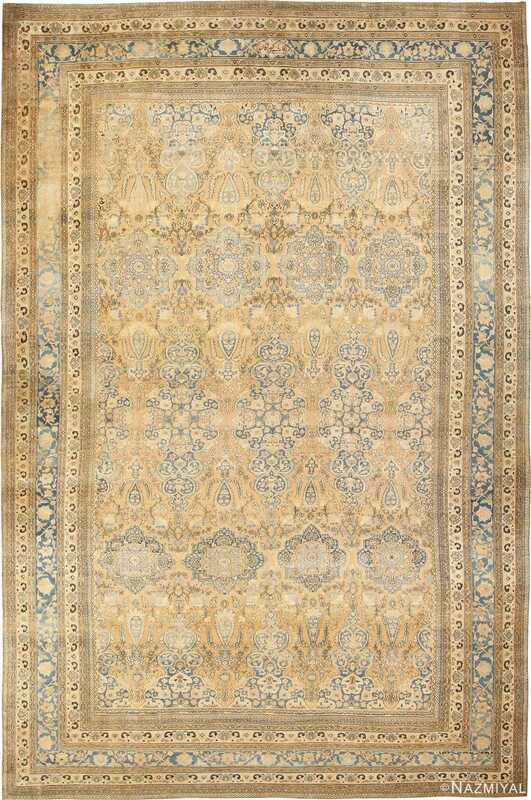 The central pattern of this antique oversized Persian Khorassan rug sticks to the floral refines floral design. The field itself is highly detailed and makes use of the same approach to symmetry. 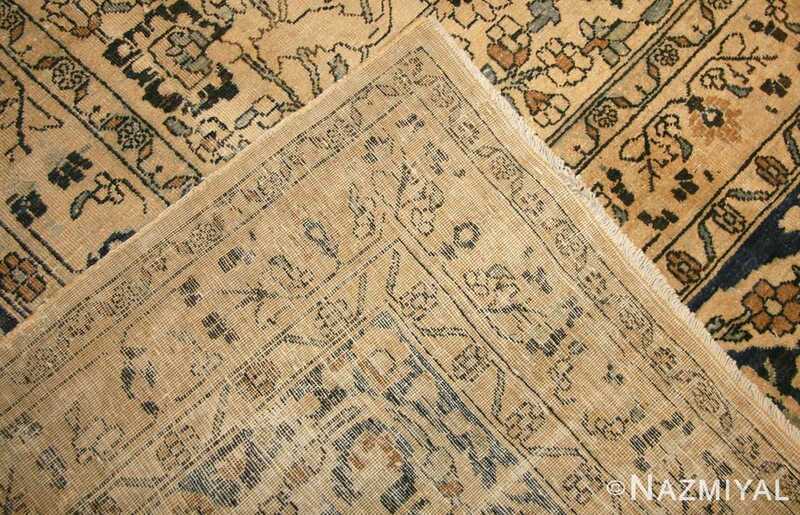 While the central pattern of the antique carpet does rely on a beige background, the use of subtle blues and neutrals throughout give this antique rug a sophisticated yet calming affect. 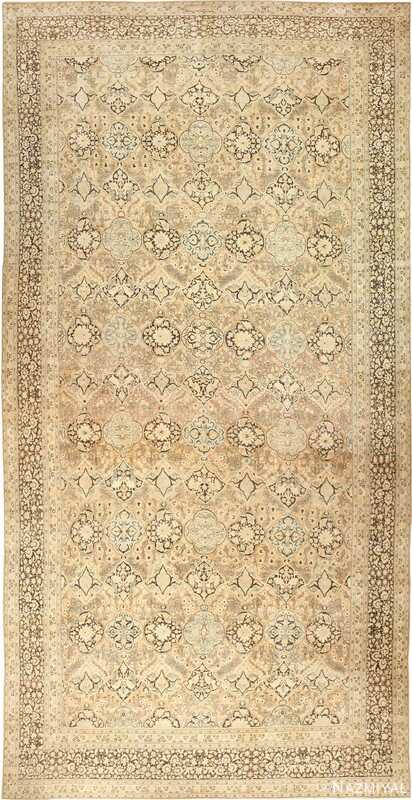 The overall neutral feel of this antique Oriental rug makes it easy to incorporate into a variety of interior decors. It’s a breathtaking piece that is sure to provide a beautifully soft textured backdrop wherever you chose to display it.